Create your own DIY trimmed cloth napkins with tassels, pom-poms, and more with this simple tutorial (no sewing machine needed). I absolutely ADORE this simple DIY for cloth napkins. It jazzes up any tablescape and you can tailor it to your color scheme! They’re simple to make, no sewing machine required. 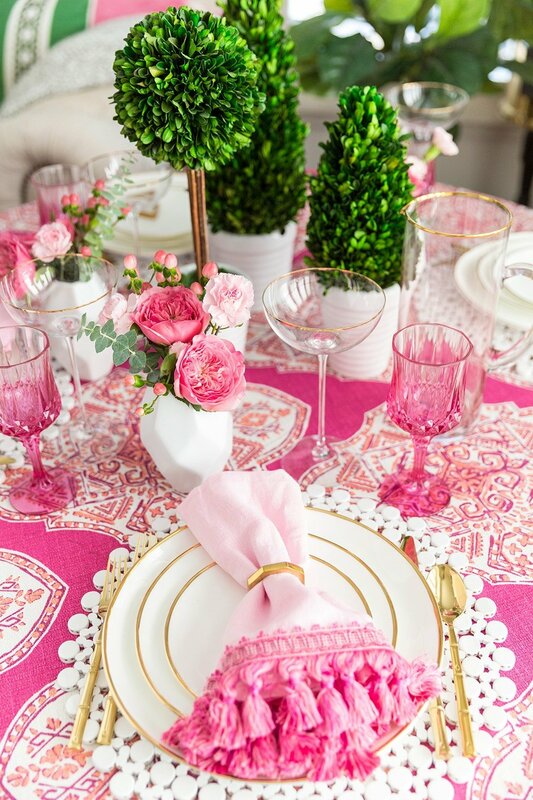 You can choose your own napkins and trim so it will match your color scheme, and most fabric stores have tons of trim options from fringe and tassel to pom-pom! I hope this video gives you a glimpse into just how easy it is to make these napkins. It’s truly as simple as it looks. Fabric glue is magical, friends. Plus, after 24 hours, it’s fully washable. That’s so important with cloth napkins because you want your guests to actually feel comfortable using them. You can wash them and the trim will not budge. The possibilities are endless for creating holiday-themed napkins to everyday ones! I can get lost forever in the trim section, dreaming up napkin combinations! While I did choose a bold pink for mine, you can always go with a basic white if you’re just trying out some designs. White goes with everything. Same on same does look great as well so be on the lookout for fun colored napkins when you’re out and about. 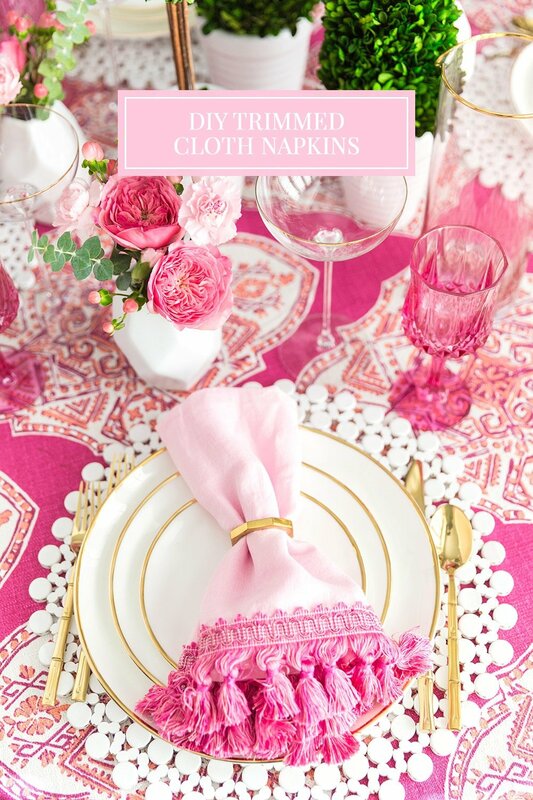 My pink linen napkins came from Sur la Table, but I’m not seeing them listed on their website. Amazon has a ton of great pink hues though, so check there! The fabric glue I used is called Fabric Fusion. You can usually find it at any craft or sewing store, or grab it here on Amazon. It’s easy to use! Lay out your cloth napkins and measure one side. Cut your trim to line up with the edge of the cloth napkin. Use fabric glue and press the trim firmly onto the edge of the napkin. Let dry for 24 hours. All done! You can watch the video towards the top of this post to see me make mine so you can get a feel for just how easy it is! These DIY Trimmed Cloth Napkins would be such a fun craft to do for a girl’s night. You could grab lots of various trims and have everyone bring a pack of cloth napkins. Pour some wine and craft the night away! I love easy DIYS like these trimmed cloth napkins that turn out beautifully (even for the DIY-challenged) and can be used for entertaining for years to come. Looking for more party DIYs and ideas? Check out my latest book Pizzazzerie: Entertain in Style filled with over 50 party recipes with coordinating tablescapes and matching party DIYs! They look beautiful but how in the world will those napkins be washed??? ?The tassels will get ruined! Vinnie, glad you asked! I did was them, on delicate, and they look 100% fine. The tassels look just like they did before. I suggest line drying (as I do with all decorative fabrics) but I happened to one run through the dryer on low and it was also fine. Thanks for your comment! I love those napkin rings! Where did you get them?